For Round 2 of the Book Tournament, I had to evaluate two very different books. Gabi, A Girl in Pieces and Noggin come from almost the opposite ends of the genre spectrum: the first was a realistic tale of teenage life while the second was more in the vein of Science Fiction. 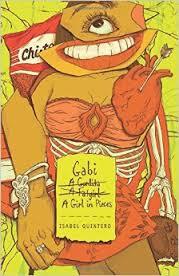 Gabi, A Girl in Pieces by Isabel Quintero is a look into the microcosm of one girl’s senior year in high school. Told in diary format, Gabi goes through a rollicking year, and Quintero does an amazing job highlighting the difficulties of teen life: from attempting to create meaningful relationships with friends and potential romantic partners to the difficult realities of teenage pregnancy, addicted parents, and coming out as gay to your parents, all together with the poetry that she is beginning both to study and to write. Gabi is also an interesting look into the culture of Mexican Americans, and interweaves Spanish and English into the text with great success to create an intercultural bilingual experience. Gabi the character is also someone whom I came to admire and root for very early on in the book. She is thoughtful and bold (she takes initiative when it comes to her romantic relationships, which is something I would like to see more of in literature!) and she will do anything to protect her friends from harm. Her discovery and subsequent love of poetry was a perfect complement to her character. Through her, Quintero created a believable teenage world that was easy to get lost in. 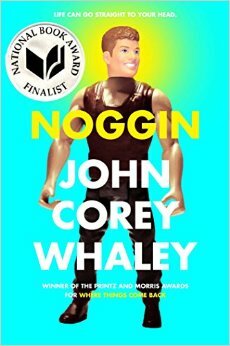 in Noggin by John Corey Whaley, Travis Coates has been reanimated, Frankenstein-style. Five years ago, he had been dying of cancer and had elected to have his head chopped off and put into cryogenic storage in the hopes that one day science would progress far enough to reanimate him. Science moved a bit faster than anticipated, and after five years his head was attached to another dead boy’s body. While he’s sixteen and feels like it’s been only a few days since he went to his cold sleep, everyone else has had five years of experiences happen to them. The readjustment both of Travis and everyone around him to his reanimation and second chance at life form the basis of the plot. Travis is very funny and sarcastic, which is a state of being I greatly appreciate. I appreciated his relationship with his parents as well as his attempts to make new friends in high school – despite the circumstances being wildly different than any other teen’s experience, everyone can relate to trying to make new friends in a strange environment. In fact, the added wrinkle of him knowing the teachers and being recognized by some of the older kids was a nice touch, and is something that younger siblings experience all the time. It was almost as though Travis’s past self was the older brother and this new Travis finds that he has to somehow live up to the ghost of his own past. However, there were some points in time when I couldn’t help but roll my eyes at him, especially when it came to his old girlfriend, Cate. While I understand the dichotomy of his experience versus the world’s experience (he feels like it’s only been a few weeks; the rest of the world knows it’s been five years), at some point in time I just wanted him to get over it and move on. That made it slightly more difficult for me to connect to him as a main character. The Verdict: Both books were interesting looks into teenage experience. Gabi dealt with the difficulties of an average teenage life while Noggin framed pretty typical teenage experiences (making new friends, getting good grades, dealing with the end of a relationship) in an interesting and unique setting (it’s not like anyone else has ever been reanimated). Both are books that I would recommend to teens and that I think they would enjoy and get a lot out of. That being said, Gabi, A Girl in Pieces quickly earned a place in my heart that Noggin failed to. While Noggin’s premise was very intriguing to me, the actual execution left something to be desired. It was still a fun book, but for me it fell short of the spectacularness that was Gabi, A Girl in Pieces. Gabi gripped me from the very beginning in a way that Noggin failed to, and I found it much easier to read and root for Gabi in all her endeavors. So while Noggin is still an amazing read, it’s just not quite on the same level as Gabi, A Girl in Pieces. This entry was posted in Book Review, Tournament of Books and tagged coming of age, Drama, Family Relationships, Science Fiction by librandian. Bookmark the permalink.